Man Steals 18 Wheeler, Tries to Evade Police in Lengthy Chase, LIVINGSTON, January 22, 2017 - In the early morning hours of January 23, 2017, at 4:03 a.m. the Polk County Sheriff’s Office received a call of a stolen truck tractor rig from One Such Road in Leggett. The truck had just been stolen from a residence where the vehicle had been running to warm up. At 4:13 a.m. Sgt. Craig Taylor spotted the stolen truck traveling south bound on U.S. Hwy 59 towards Livingston. 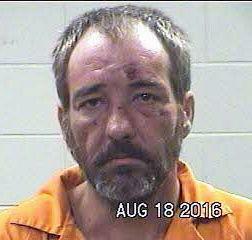 The driver, Robert Willis Sr. a 45 year old man from Leggett failed to stop for Sgt. Taylor. Willis traveled into Livingston on U.S. Hwy 59 and turned around near FM 1988 traveling north bound. Livingston Police Department assisted in the pursuit along with other deputies. Willis traveled north through Corrigan, Texas where spikes were deployed multiple times attempting to disable the vehicle. Many of the tires were destroyed by spikes but Willis continued north through Angelina County on U.S. Hwy 59 and into Nacogdoches County. While traveling through Angelina County several more attempts to disable the vehicle were made. While in Nacogdoches County, Willis traveled north around the loop to U.S. Hwy 259 and continued north approximately 10 miles towards Rusk County. At 5:55 a.m. the vehicle was finally disabled short of the Rusk County Line. Willis was taken into custody by pursuing officers. Willis was transported to the Nacogdoches Jail where Nacogdoches County Justice of the Peace Pct. 3 Leann Goerner set bail at $100,000. Willis was then transported to the Polk County Sheriff’s Office where he was booked into jail for Evading Arrest with Vehicle and Unauthorized Use of a Vehicle both charges are felonies. Sheriff Kenneth Hammack and the Polk County Sheriff’s Office would like to thank the following agencies for their assistance in apprehending Willis. Livingston Police Department, Corrigan Police Department, Diboll Police Department, Lufkin Police Department, Angelina County Sheriff’s Office, Nacogdoches Police Department, Nacogdoches County Sheriff’s Office. A safe closure to a potentially dangerous situation is always paramount.